You don’t need a licence if you never transmit… – The Radio Amateur Society of Australia Inc. I was first licenced as VK2AFD in Sydney in 1979. Back then, Sydney’s two metre repeaters were busy all day. This trend continued for all of the 1980s and most of the 90s. You could always get a contact on VHF/UHF FM in those days. There were dozens of regular users. I often visited other capitals and regions, where activity was similarly high. These days, activity in Sydney is dismally low. Although I’m a VK4 now, I often visit Sydney where I have a UHF/VHF FM and digital station set up. I scan all of Sydney’s 70cm analogue and digital repeaters during the day – the radio will often remain quiet for hours…. Many of the repeaters are well sited and engineered, with city wide coverage, yet they sit idle all day. The digital repeaters offer Australian and world-wide linked coverage….is no one interested in working other states or DX anymore? A recent trip to Melbourne and Tasmania revealed some degree of activity on 2m and 70cm, but it is a mere fraction of what it used to be. As for country repeaters…..forget it. My local analogue repeater in Cairns is seldom used. You may as well turn it off. Amateur numbers have increased over the past 30 years, and yet activity on what was amateur radio’s most popular mode – VHF/UHF mobile – has seriously declined. Ironically, the number of repeaters has at least tripled since the 80s. After perusal of the repeater list, I was amazed to find that there are around 50 VHF/UHF repeaters in the greater Sydney basin. That is an awful lot of resources, power and, most importantly, radio spectrum sitting there unused most of the time. Why aren’t Australian radio amateurs using repeaters? I have thought long and hard about this. Of course, the first answer must be related to the growth of the internet, right? You can’t use the internet in your car – well, legally at least. There are still amateurs who drive for a living all day – the number would have grown since the 80s….they are still out there. Digital radio is widely used in the commercial land mobile sector these days. This trend has been mirrored in amateur radio, with a number of digital modes, such as DMR, P25 and D-Star in use on VHF/UHF. One particular mode, Digital Mobile Radio (DMR – see DMR explained) offers an interesting snapshot on the take up of new mobile radio technology by amateurs. To use DMR, you must apply for a unique 7 digit ID number. There are around 1500 DMR ID numbers assigned in Australia. Many operators have two numbers – one for the shack and one for the mobile. If, for argument’s sake, we assume that 75% of users actually have DMR radios, that gives us a figure of around 300-400 amateurs able to operate through the network. There are currently 30 Australian DMR amateur repeaters connected to the DMR world-wide network. They are located from Darwin to Hobart, and across to Adelaide and Perth. Sydney and Melbourne have 4 each. These are all linked together and also are connected into into the world-wide network, which has over 500 repeaters across many countries. As a keen DMR operator, I monitor the network most days. Australia wide, there are around 8-10 regular, daily users. Where are the rest? Are they listening? If so, why don’t they talk? Imagine a VK and world wide repeater network 25 years ago? It would be absolutely flat out. You would be hard pressed to get a word in! I remember when the Sydney and Perth 2m repeaters were linked by AUSSAT in the 80’s….it was amazing. The VK DMR network is professionally engineered – all the repeaters are Motorola units, designed to be networked together, and the server is hosted in a commercial data centre with Gigabits of bandwidth available. The network performs very well, yet activity seems to wax and wane. Some weeks the traffic is up, and the next all is quiet. It appears that amateurs purchase radios, program them, get on the network full of enthusiasm and then put the radio in a drawer….why? Many amateurs listen…and listen only. Why buy a transceiver and use it as a receiver? Have Australian amateurs become SWLs with licences? What I find fascinating is how an active mobile user can stimulate activity on a repeater. There are three or four active VK2, VK3, VK7, VK5 and VK6 amateurs running DMR whilst mobile – I work them daily from VK4. They have lifted activity on the network by their sheer perseverance. Alas, it appears that these amateurs are the exception rather than the rule. Modern vehicles, with their limited space, complex electronics and air bag systems do represent a challenge for the mobile amateur. However, it is possible to install a VHF/UHF transceiver in a late model car – all you need is patience. Any hole drilled in a visible position can be mended with plastic welding when it comes time to remove the radio. Apparently, the repair process hides the hole completely. And, when it comes to antennas, there is only one solution for any self-respecting amateur interested in the best possible performance – a through roof mount, in the centre of the roof…. All of my vehicles have had a centre roof mounted antenna. It is the neatest, lowest profile and most effective solution. 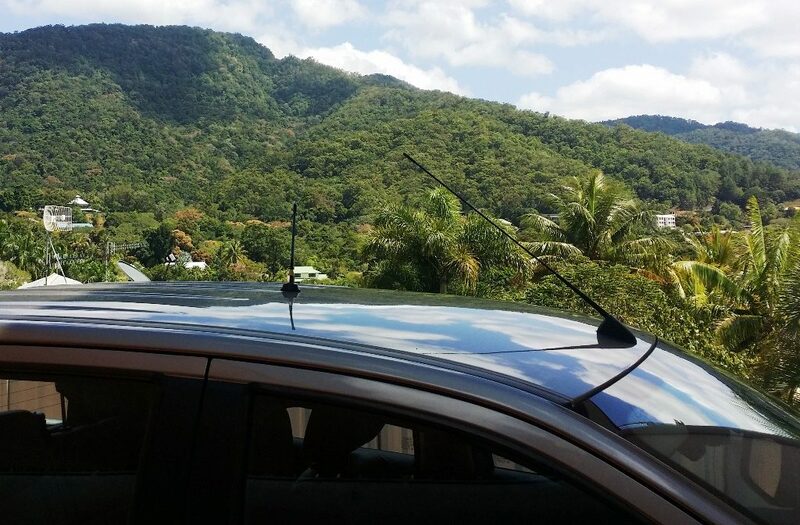 Roof mounted antenna bases do not affect resale value – I have never had a problem at trade in time. It has become somewhat of a cliché, but we indeed need to use our bands if we are not to lose them. This does not necessarily apply to bands in which amateurs have primary status, like 2 metres, however, we are a secondary service in 70cm – there by a grace and favour arrangement with Defence, in effect. The original 30MHz of the 70cm band has been steadily whittled away, as it is very valuable spectrum for land mobile users. We are down to 20 MHz, and that will most probably shrink to 10 in the next few years. There is significant pressure on the commercial UHF land mobile spectrum in Melbourne and Sydney. Meanwhile, dozens of amateur repeaters sit idle in Sydney and Melbourne. This situation can not last….we will lose more spectrum….unless we are willing to do something about it.